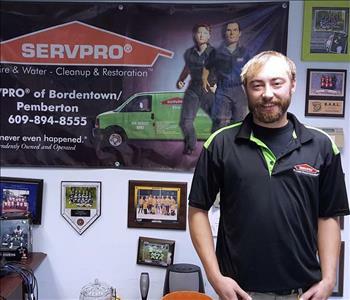 Tara is our Office Manager at SERVPRO of Bordentown/Pemberton. She has been with us for five years having come to us as an Estimator in the Restoration industry. 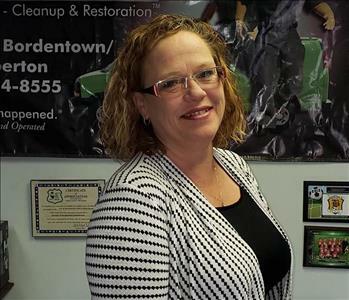 She has her Water Restoration Technician Certification through SERVPRO’s Employee Certification Training Program and is IICRC certified. Tara resides in Tabernacle with her husband Joe, her two stepchildren Cody and Jordan and her dogs Beasley, Louie and Presscott. Tara enjoys bartending, reading, cooking and animals. 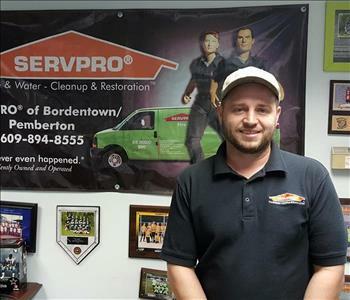 Steve is our Production Manager at SERVPRO of Bordentown/Pemberton. He has 10 years’ experience and has the following certifications from the Institute of Inspection Cleaning and Restoration Certification (IICRC): Water Restoration Technician and Applied Structural Drying Technician. Steve is also certified as a Crime and Trauma BioRecovery Technician with the American Bio Recovery Association (ABRA). He also holds certifications in Lead Testing from the Environmental Protection Agency (EPA) and Bloodborne Pathogens Training from Stericycle. He resides in Trenton with his wife Colleen, his dogs Franklin and Henry, 3 cats and 8 fish, and enjoys cooking, driving, gaming, and hockey. 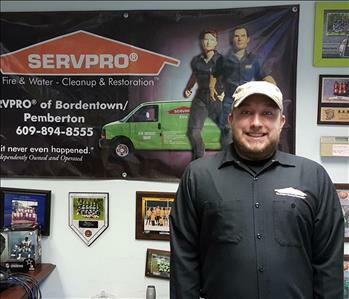 Mike Jarkowski is a Lead Crew Chief at SERVPRO of Bordentown/Pemberton. He has 7 years’ experience and is certified as a Water Restoration Technician, Applied Structural Drying and Applied Microbial Restoration Technician by the IICRC. 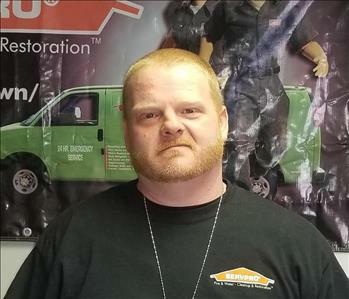 He also holds certifications in Lead Testing from the EPA, Bloodborne Pathogens with Stericycle as well as water, fire, upholstery and carpet cleaning through SERVPRO’s Employee Certification Training Program. He lives in South Hampton and enjoys having fun, playing the guitar, and wood carving. His brother Steve is our Production Manager and thinks his mom and dad are pretty cool too. 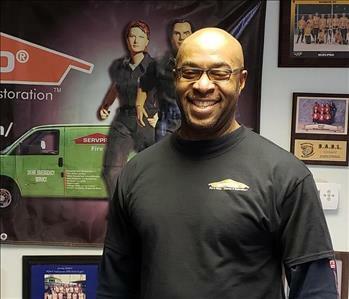 Gene Gilbert has been with us for over six years now as a Production Technician. He has completed training in Bloodborne Pathogens with Stericycle. He lives in Hamilton with his girlfriend of 11 years, Stephanie, their daughter Elizabeth and step son Christopher. He enjoys outdoor activities, fishing, scrapping, and country music. Sean is a Crew Chief and joined our team November 2017. Sean brings a wealth of experience from the demolition and construction industries. 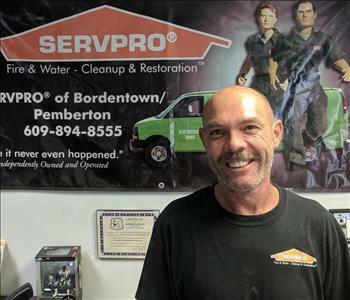 He has completed his in house SERVPRO certifications. He is also certified as a Water Restoration Technician (WRT) with the Institute of Inspection, Cleaning & Restoration Certification (IICRC). He is a dedicated father and husband who enjoys hunting and fishing in his spare time. His family resides in Browns Mills, NJ. Beth is one of our newest team members and has joined us an Administrative Assistant for our office and marketing departments. She lives in Willingboro with her two children Joseph and Julianna. She has two cats Tinkerbell and Ginger and is currently fostering her nieces snapper turtle Michael Angelo. She enjoys spending time with family, cooking, gardening and watching football. Kevin is one of our newest team members and joined us as a part time Production Technician. He joins us on his days off as a career firefighter with a Mercer County fire department. Marco joined us originally as a Production Technician but we quickly saw that his large personaility would be a great fit as a Marketing Manager and moved him into this role. 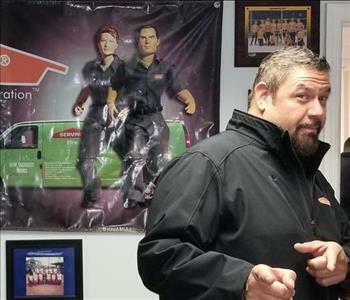 Marco was a cabinet maker since 16 years old and has a wealth of experience in custom furniture and counter tops and spent fifteen years as a Manager and kitchen designer for Home Depot. He enjoys woodworking and riding his motorcycle. Sam is one of our Production Technicians who came to us with a background in pack outs and asset moving services. He and his wife, Theresa, have three kids, Ashley, Liam and Adrianna and live in Columbus. Sam is a volunteer firefighter and enjoys spending time with his family and video games.